Our love story started when we were working as interns. We have been together for 6.5 years now and how we started dating was through a simple "magic" my then-boyfriend tricked me. He asked me to open my hands if I believed that we will be together in seconds. So what he did was just to interlocked with my fingers and held tightly saying "TADA", we are a couple. The reason why he did that was because I did not dare to step out of my comfort zone, afraid of being judged as our height difference was huge. It was nothing fancy but at that moment my mind was blank and even till now there are butterflies feelings. 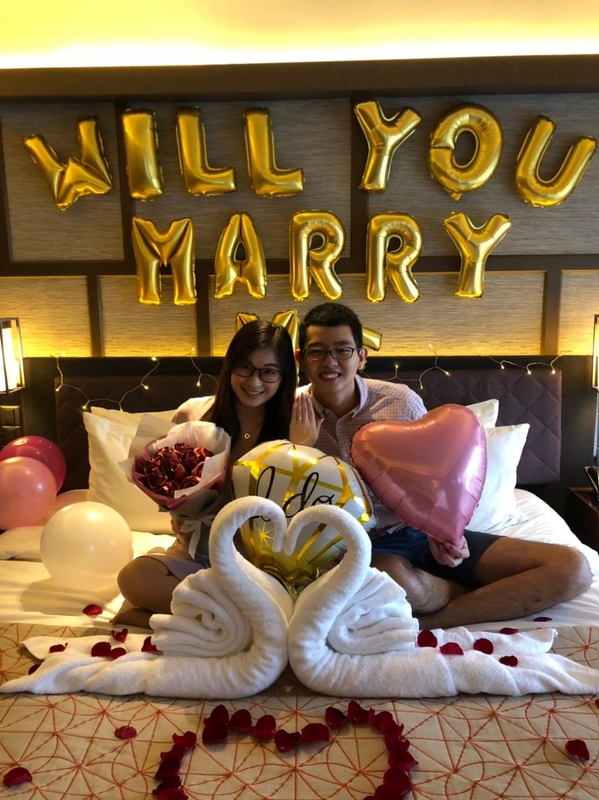 So last Christmas, we were supposed to crash our friend's staycation at Pan Pacific Singapore. To my surprise, the moment i entered the door, it was dimmed and floor was full of candles with rose petals leading me to the bedroom. 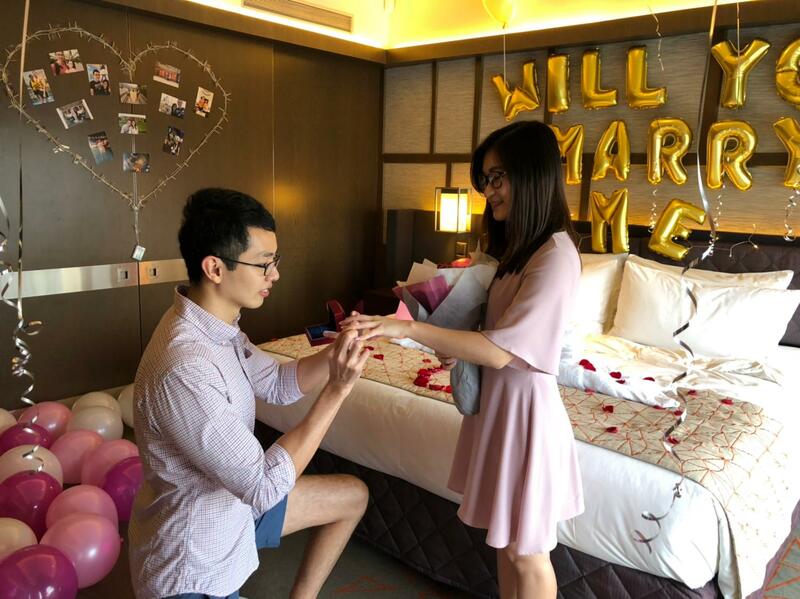 I opened the next door and there were balloons with words "Will You Marry Me" While I was still in shock, he kneeled down saying his speech about how we got together and if I still remember about the "magic". I was told to close my eyes while he performed his magic by showing me the ring. Not forgetting I even hinted for paper roses bouquet as it will never wither. The bouquet has 12 roses meaning everlasting love. Of course, I was really touched and said YES! 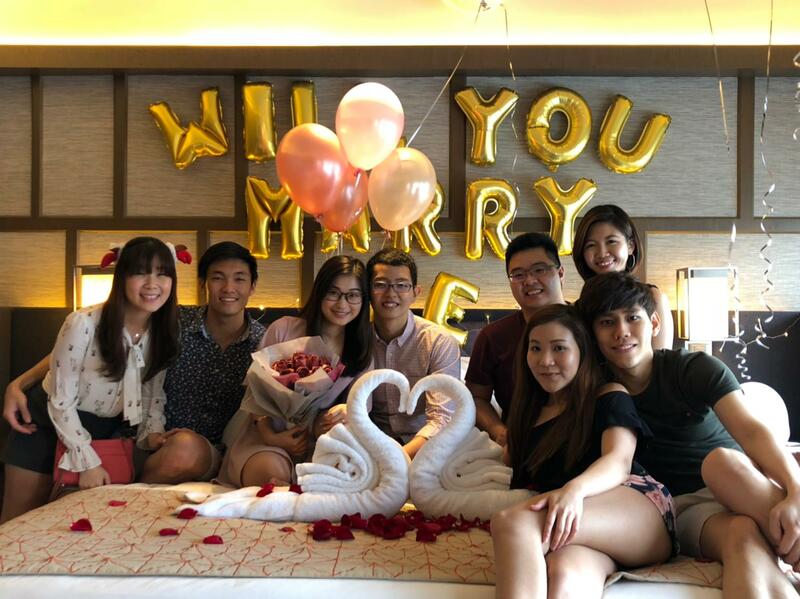 Really appreciate these bunch of friends for making it a successful surprise proposal!